Here's where things get interesting. Alfonso Cuarón was probably not a predictable or safe choice (although, yes, I know he'd made A Little Princess), but he was the best choice. Sure, I wonder what it would have been like to have a single director over the course of the whole series, but as well as the series comes together as a whole, each book does have a different sensation to it, so it's fitting that we've had different filmmakers lend them all different approaches. Cuarón gives the franchise a shot in the arm, a wonderful new energy and vitality. He is a director with a strong presence - he doesn't lose or betray Jo Rowling's voice, but he adds his own, and while not every artistic flourish works, he understands precisely the tone, the spirit, and emotional depth of this installment. Here we are with the first Harry Potter book that can't be basically reenacted in live action, without just droning on and on. There's one significant cut that's problematic, and we all know what it is, and I'll get to that later, because I've never read a Prisoner of Azkaban script, so I'm not sure if it was a decision from Kloves or Cuarón. For the most part, this is a great screenplay. With the sheer volume of detail, the number of scenes where characters sit around and exchange information, this must have been a challenge - it's all compelling information, but not exactly scenes that present potential for compelling cinema. The scenes inside The Three Broomsticks and The Shrieking Shack are streamlined so well, and the pace is just right. Kloves zeroes in on what's really important here, and that's true of the entire film. Wow, what an improvement! Sure, by this point, these three know their characters well, but the performances from each of them (especially Dan) are far better than what we saw in Chamber of Secrets, so Cuarón must deserve some credit for that. (Those essays must have paid off - well, except for Rupert.) Watching Dan Radcliffe in Prisoner of Azkaban is watching the birth of a proper actor - not every moment is golden ("HE WAS THEIR FRIEND!" has become sort of infamous - 'though I think it gets too much hate), but he is great, a very soulful, deeply felt performance. This one lives or dies based on him much more than the first two, and he carries it. And yet...It's not really accurate, but this kind of feels like Hermione's - and therefore Emma Watson's - movie. I'm really rooting for her to go on to great things as an actress post-Potter, because this is a star turn. Watching Hermione take charge, think on her feet, and improvise rescues of both Buckbeak and Sirius, but not as the perfect, always-in-control, "Well, of course, haven't you read '__________'"? type, is incredibly fun. Ron's kind of left by the wayside this time, that's just the nature of this one. Rupert's good, he's not just the comic sidekick this time; he just doesn't have much to do (he has the funniest moment of the movie, though: "Spiders! They want me to tapdance. I don't want to tapdance." Love Harry's response of, "You tell those spiders, Ron," too). You have to admire this one. 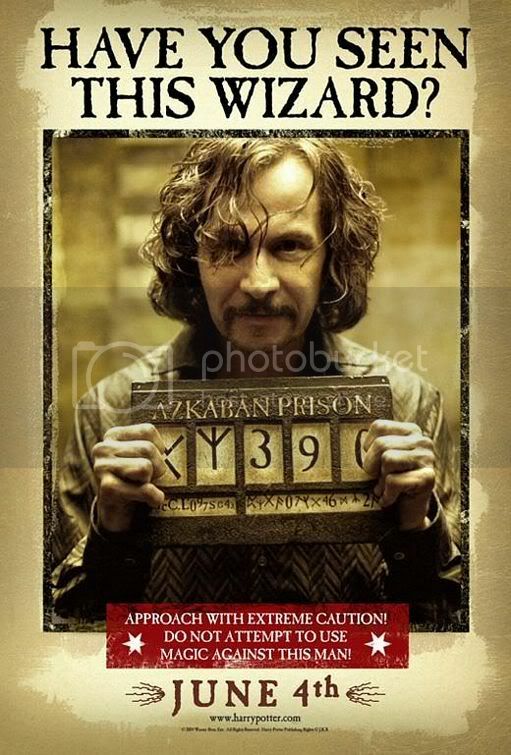 You have to admire how Oldman is utterly believable as Sirius Black the servant of Voldemort, Sirius Black the boogeyman, Sirius Black the traitor, and then utterly believable - pretty much turning ion a dime - as the betrayed, someone we should empathize with, something who's actually looking out for Harry. He's positively magnetic as an actor and screen presence, and Sirius' rapport with each character he interacts with is unique and compelling. Ultimately, Sirius' scenes are truly touching, in particular his moments with Dan Radcliffe. Again, touching; that seems like the most appropriate word to describe David Thewlis' portrayal of Remus Lupin. I love the intimacy and tenderness of the scenes Harry and Lupin share - the heart of this movie is in those scenes. I know Lupin's not among the most important characters after this, but you have to wish Thewlis had more of a chance to shine, because he is so, so very good here. The dirty rat! (It's not often you can say that literally - unless you're actually talking to a dirty rat, of course.) Spall's terrific as the utterly despicable sniveling little coward Wormtail (I'm not a fan, can you tell?). You can see him as the member of the group who'd just be trailing the others, just happy to be there, but resenting, to himself, that he wasn't treated like a real part. It might be a backhanded compliment toward Tim Spall to say that he's very convincing as a man who's spent the last 12 years living as a rat, but he is. She makes it look like the easiest thing in the world, Emma Thompson. The character's slightly different from the book - a little dimmer, a bit less your typical hushed-tones psychic - but Thompson's a perfect fit. She's the ultimate seer who cannot see; she'll blather on about "the beyond!" and then stumble at a table right in front of her. And yet, she does actually have a gift, she's not a complete phony - but that gift possesses her, she's not even aware of when she does demonstrate her ability as a seer. My favorite Emma Thompson-as-Trelawney moment is her completely condescending tone to Hermione when she dismisses her potential ("...your soul as dry as the pages in the books to which you so desperately cleave"), and the honest obliviousness to why Hermione might be upset by it. I'll wait and see (er...hear) if I still think this is the best of the Harry Potter scores, but so far, it still is, and it's also one of John Williams' best period. There's great variety of sounds and moods, and you can tell just by listening to a track like "Aunt Marge's Waltz" or "The Knight Bus" that he's having a lot of fun. And then there's "Buckbeak's Flight," which is exhilarating and moving, and hits Williams' knack for writing great themes of flight. And "A Window to the Past" is, in my opinion, second only to "Hedwig's Theme" as the greatest piece of music created for the series (again, so far - but it seems unlikely that that'll change in my mind). It's absolutely beautiful. Not everything about Hogwarts - interior and exterior - has changed, but it all looks so different. We have a new director and a new D.P., though, so that's to be expected - different filmmakers are going to shoot the same locations in different ways. The environments in Prisoner of Azkaban have far more texture; this is a world that seems not just vast, but lived-in. Things aren't so shiny and new anymore; some places are shabby, or filthy, or messy. All of it goes to making everything more convincing. The drastic changes in the way Hogwarts looked - new exterior environs, the relocation of Hagrid's hut and The Whomping Willow - bothered me at the time, but not so much anymore. I'd appreciate greater consistency, but the changes were made because they worked for the needs of this movie. The darkness has arrived, and it's not going anywhere. This is a beautiful-looking film, and it's "dark" in a different way than the next four/five. The Dementors do bring a certain bleakness to the proceedings, but the atmosphere here is more fairy-tale fright than the more grounded horrors to come; "playfully macabre" might be a good way to describe it. I'm not trying to sell it short, because there is real tension here, and the cinematography from Michael Seresin brings a lot of that. -I still hate that opening scene. I get it - Harry's a teenager now, the whole movie is itself a bit of a teenager, and as far as jokes about Harry playing with his wand go, it's a good one. The problem for me is that, in a few short minutes, Harry's going to be afraid that he'll be expelled or worse for accidentally inflating his aunt, and here he is not so accidentally performing a rather noticeable spell that even ends in a "maxima." It's a nitpick, and that's why it's in this section, but the inconsistency bothers me, because it's just that: a joke about Harry playing with his wand. -That Knight Bus scene would be perfect if it weren't for that damn shrunken head. Puns are painful, even when delivered in a zany Jamaican accent. So annoying. -Why is Tom a hunchback now? Not just a hunchback, he's Igor. I wanna know what happened in between movies one and three. -The very concept of Dementors is a chilling one, and the film's execution of them is amazing; they are truly terrifying. All the shots of the way the Dementors affect what's around them are pretty powerful, my favorite being the flowers freezing and dying as they glide over them. -I don't quite believe that Dumbledore would actually bring in a choir to sing "Double Trouble" right before warning the students not to let darkness overwhelm them. Maybe you could chalk it up to Dumbledore's whimsical, slightly twisted sense of humor, if you want to think of a reason for it. -Parvati's "funnier" boggart is SO MUCH WORSE. -Lupin interferes with Harry's turn in the boggart lesson because he assumed Harry's boggart would take the shape of Lord Voldemort. Okaaaay, that made sense on the page, but here, Lupin sees Harry's boggart, and it's a Dementor. No mistaking it. -Only Alan Rickman could make a line like, "Turn to page 394," which is just a sentence, it's nothing special, and turn into a moment. The first trailer (or maybe it was the second) opened with that line! -I love Ron and Hermione's awkward, pre-flirtatious moments in this movie. -I remember how excited I was when I first read the book and came to Hermione slapping (in that case) Malfoy. I love the punch even more. Plus, it has the automatic benefit of us seeing it. -"What would you have done?!" "I would have died! I would have died rather than betray my friends!" So powerful. -Okay, so it's kind of the elephant in the room with this movie: Who are the Marauders? We don't find out, and what that means is that (A) the Marauder's Map is just a prop, a neat object, and a bit of a plot point when it could be more, but, more importantly, (B) we don't have a really great illustration of their friendship that we could use. Here's how it should go: Harry insists, "The map lied, then! ", Lupin responds, "The map never lies," and then Harry asks, "How do you know?" to which Lupin replies, "Because I made it - along with Sirius, and your father - and Peter Pettigrew," and then the scene proceeds as it does. In Lupin's final scene, have a couple of lines telling us that James, Sirius, and Peter stood by Lupin in the worst time of his life, and became animagi so Lupin would have some support. It would not add much time at all, but it would add some more resonance to those relationships, and a little more depth to the film, with just a few new lines. -I'm not sure how I feel about that final shot. I've gone back and forth on what I think of it over the years. Prisoner of Azkaban isn't my favorite film in the series, but it is very satisfying. It marks a huge leap forward in emotional richness, and a leap forward for the series as a film series. Last edited by IenjoyAcidPops; July 13th, 2011 at 5:19 pm.